This is far from the conventional mayonnaise based potato salad that most people have in their repertoire. 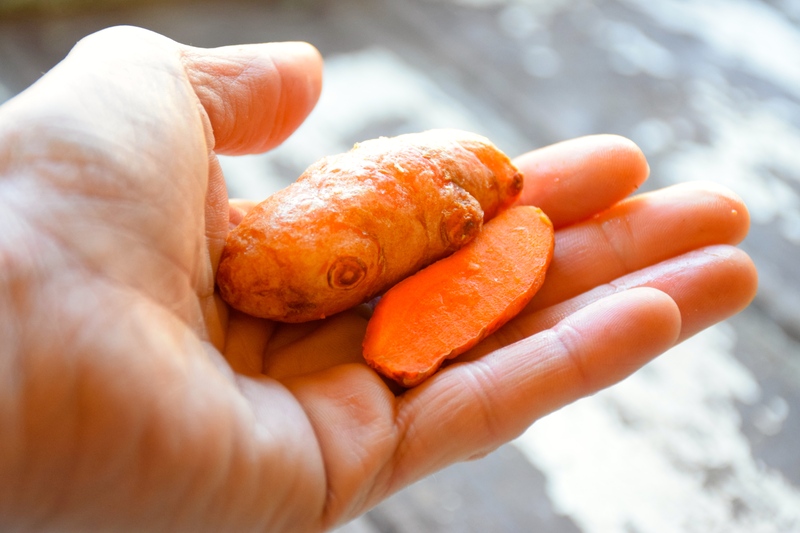 This little beauty uses fresh turmeric added to the potatoes before boiling so the colour leaches out and stains the potatoes a vibrant yellow. It’s flavoured with coriander seeds, cumin seeds and nigella seeds, which are all roasted off in a pan first to best release their flavour. Each time I make this salad my head starts to nod of it’s own accord. I cheer the brilliance of turmerics soft gentle flavour and what roasted spices can do here, and that just right flavour that slow cooked onions adds to this dish. And there’s the yoghurt. Spices and yoghurt could go with just about anything. Wouldn’t you agree? This extraordinary tasting salad can be eaten warm or cold. As a side to a steak, chicken or fish. As part of a buffet of salads, or even served in a wholemeal wrap with extra yoghurt and coriander. The possibilities are endless. So spice it up. Leave the skin on the potatoes and cut them into 4cm dice. Place in a medium pot and cover with cold water. Add the grated turmeric and a large pinch of salt. Bring to the boil and cook for 8 – 10 minutes or till potatoes are just soft. Drain and leave to steam in the colander for 5 or more minutes. Meanwhile, place the quinoa in a small pot, cover with water bring to the boil and cook for about 15 minutes, drain and set aside. 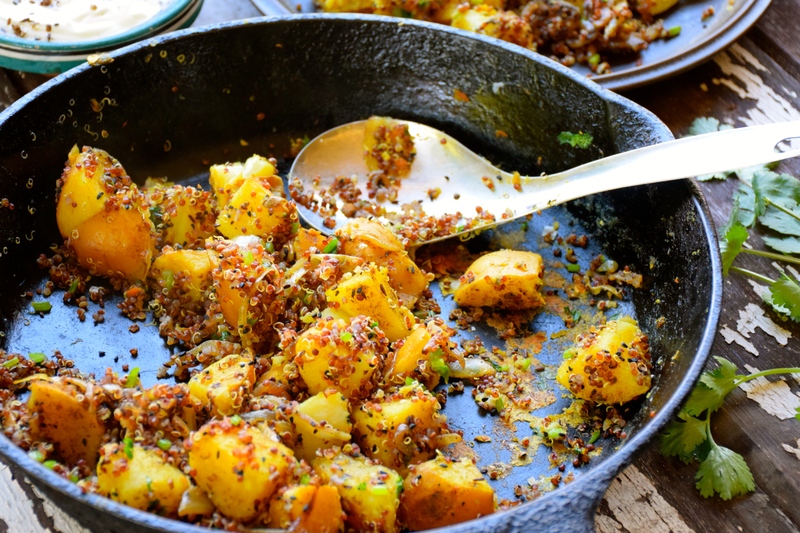 Place the coriander seed, cumin seed and nigella seed in a separate small pan. Toast the spices till they start to pop. Cool slightly them ground roughly using a mortar and pestle. Heat 1 tbsp oil in a large frypan. Add the onion, season with salt and pepper and cook on a low heat for about 8 minutes, till caramalised. Set the onion aside. Wipe out the fry pan and add 1 tbsp oil, add the cooked potatoes and fry lightly in the pan for about 5 minutes. Add the chopped coriander stem, cooked onion, roasted ground spices and cooked quinoa. Toss to combine. Season with lemon juice and taste for extra salt and pepper. 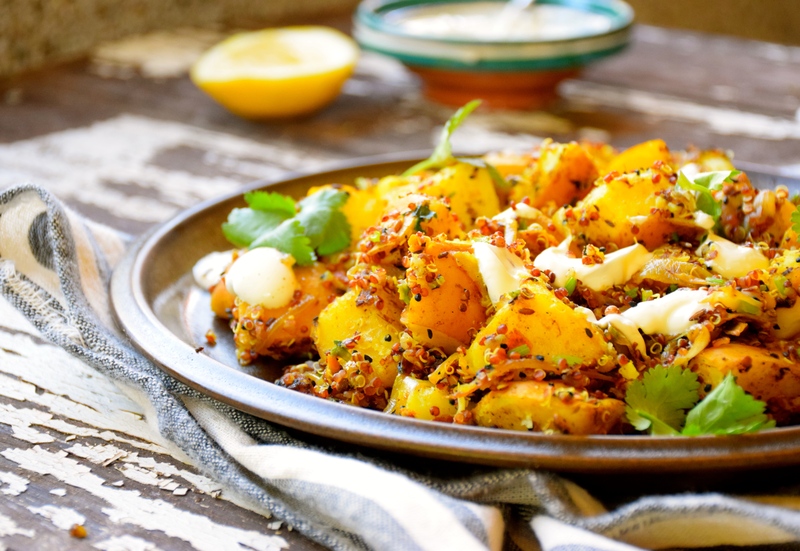 Serve the potatoes on a large platter, garnish with dollops of yoghurt and picked coriander leaves. This looks soooooooo good – going to give this a shot on the weekend. Great. It’s so delicious, I know you’ll love it. Oh now there is a dish you want to just dive right on in and eat with your eyes! Looks stunning and I’m sure would taste just as amazing! Cheers Matt. Your shakshuka you posted looked pretty delicious. You are so creative Michelle! I absolutely love the idea of cooking potatoes with tumeric, and beetroot stems as a vegetable!! I often use the leaves, but I usually throw the stems away. Not anymore! You’re very kind Chez. I’m still thinking of that delicious looking ricotta, blueberry and hazelnut cake you posted on Instagram on the weekend, and with homemade ricotta – amazing! On the root-to-stem eating, my favourite is radish tops – I recently did them in a pesto along with sautéed radishes. Wow Beck, you’ll absolutely have to make this with your Mums home-grown turmeric. I’d be interested to know the ease or difficulty of growing some myself. I’m yet to do radish tops, sounds great. Thanks Seana. I can imagine your apricot clafoutis (will have to try) as the perfect dessert to follow this potato salad. 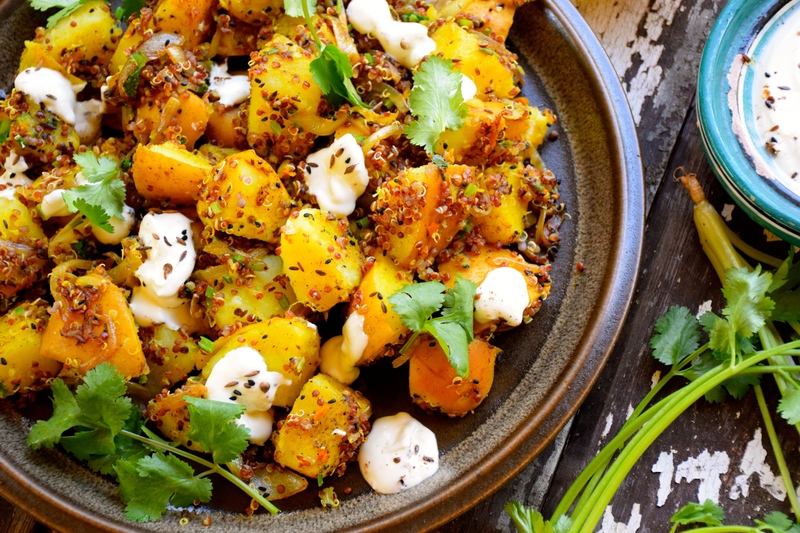 I was a bit apprehensive because I don’t love quinoa, but this loos spectacular! Love it! The quinoa is more of a garnish than a main ingredient so you might be surprised that it adds just a hint of something nutty. Of course you could leave the quinoa out, or replace it with chickpeas. This sounds so good and a beautiful photo as well!